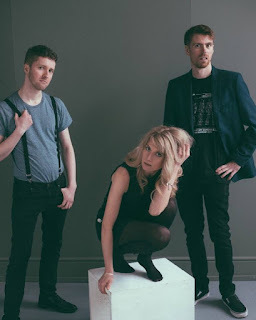 NEW MUSIC PROFILE - POP ROCK BAND "CHASING INFINITY"
Regulars on the Cheshire music scene, Chasing Infinity first caught my ears early in 2014, when I was studying for my Music Journalism Diploma. I wrote an article called "Cheshire Rocks" featuring the band with three other artists. The article eventually became published in a local magazine. I have followed closely the band and also saw them accompany The Fireflys at The Brindley Theatre in Runcorn in June 2015. Playing a great blend of pop rock, they formed in 2009 and released their debut album, “Chasing Infinity” in 2012. An acoustic E.P. entitled “Chinfin Unplugged” was released in 2013 and the last album, "Inaction" which contained the brilliant "Dance With The One That Brought You" came in 2015. Now down to a three piece band, their 80s inspired tracks are a hit with me, being a nostalgic 80s music buff!